Melbourne Victory kept up its winning record against Wellington Phoenix, but only just, despite getting out to a three-nil lead with only nine minutes left to play. Two goals by Kiwi international Jeremy Brockie reduced Victory to time-wasting in the last few minutes, but it seemed that some players had switched off much earlier. Coach Ange Postecoglou was more than a little angry that the discipline he has been trying to impart was lacking both in attack and defence in the final stanza of the game. Up till then he had been happy with the performance and the three cracking goals which resulted. Postecoglou shuffled the pack as Diogo Ferreira came into midfield along with Billy Celeski, Gui Finkler and Mark Milligan, with Adam Traore, Petar Franjic, skipper Adrian Leijer at the back. 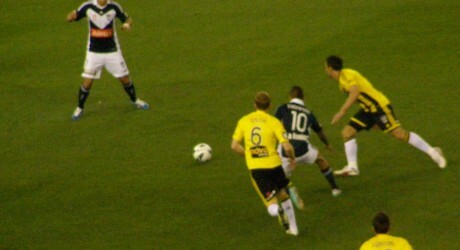 Marcos Flores, Marco Rojas and Archie Thompson formed the attack. Michael Boxall replaced the suspended Ben Sigismund for the Phoenix. Otherwise the team was near to full strength. Victory might have taken the lead after only 9 minutes when first Flores sent Thompson clear only the Socceroo striker fired wide, then immediately afterwards Finkler broke through on a long ball but Paston spread himself to block the shot. In 23 minutes Victory sliced through the Phoenix defence as Flores put Thompson away in the old inside-right position from which he cut the ball across to the unmarked Rojas who finished easily. Flores then had a spell in which he kept giving the ball away when in good positions, but then he redeemed himself with a series of close-quarter one-twos with Finkler ending with a shot into the corner of the net. This was more like the game Ange Postecoglou has been trying to get his charges to play and the confidence flowed through the side. Phoenix was forced back time and again, but kept trying to rebound and did have a couple of good chances of its own, particularly when Louis Fenton put over a cross from the right and three Kiwi attackers tried desperately to get a decisive touch on the ball as it flew across the goal area. That was in the 17th minute. After the break Phoenix flew out of the blocks and forced Victory into a series of defensive blocks, but then the home team rebounded in the 48th minute when Mark Milligan fired a long ball to Thompson who sprinted down the left and crossed for Rojas to get his second goal from close range. Three substitutions may have disrupted some of the Victory rhythm as Jimmy Jeggo replaced Finkler after an hour, while Jonathan Bru came on for Flores and Andrew Nabbout for Marco Rojas in the 75th minute. Certainly that changed the dynamic of the game. In 81 minutes Jeremy Brockie found himself with some space out on the left and calmly lobbed the ball over Nathan Coe, for what appeared to be a consolation goal only for the visitors. But when Victory conceded a free kick on the edge of the area two minutes into injury time, Brockie’s shot went into the net off the keeper leaving Victory with a fraught couple of minutes to play out time which they managed to do successfully. But it did not help the goal difference, which remains negative. Andrew Nabbout made his debut against Brisbane, where he started. He joined Victory from Moreland Zebras and is 19 years old. Ange Postecoglou thinks he is a real prospect, scoring goals in the youth team and deserves his chance with the first team. Ricky Herbert praised the youngsters he brought on—Tyler Boyd and Ben Totori— and the contributions of senior players Paul Ifill, Leo Bertos and Brockie. Given the difficulty the Phoenix has had in recent weeks in fielding the same team in successive games it is perhaps to be expected that performances have not been consistent so far. But do not write the Kiwis off at this stage. For Victory there are some lessons to be learned about not following the game plan when the team gets ahead and no doubt this will be hammered home at training this week ahead of a very big match away to Sydney next week. 39. Nathan COE, 3. Adama TRAORE, 4. Petar FRANJIC, 5. Mark MILLIGAN, 7. Guilherme FINKLER (17. Jimmy JEGGO 59’), 9. Marcos FLORES (8. Jonathan BRU 75’), 10. Archie THOMPSON, 11. Marco ROJAS, (26. Andrew Nabbout 75’), 13. Diogo FERREIRA, 14. Billy CELESKI, 23. Adrian LEIJER. Unused substitutes: 1 Tando Velaphi. Mark Paston (GK), 2. Manny Muscat, 3. Tony Lochhead, 5. Michael Boxall, 6. Alex Smith, 7. Leo Bertos, 8. Paul Ifill (12. Tyler Boyd 56’), 10. Stein Huysegems (9. Benjamin Totori 56’), 11. Jeremy Brockie, 16. Louis Fenton (17. Vince Lia 65’), 22. Andrew Durante.